and teachers as to what should be make (Abram et al., 2002). contexts (Casanova, 2008; Laurillard, 2009). 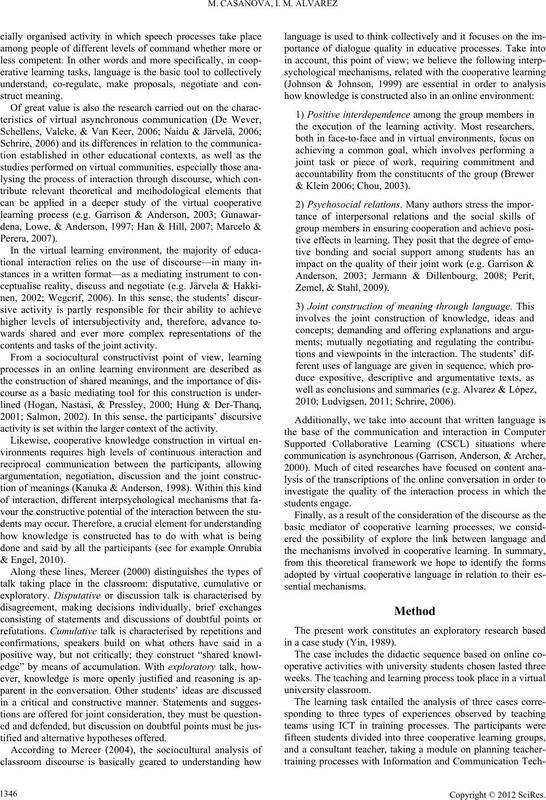 antee learning effects (Dillenbourg, 2002). contents and tasks of the joint activity. activity is set within the larger context of the activity. tified and alternative hypotheses offered. & Klein 2006; Chou, 2003). 2010; Ludvigsen, 2011; Schrire, 2006). in a case study (Yin, 1989). ence as student in an online environment. each group sent to the teacher. and Group C, n = 31.
information extracted from a segment of content” (p. 193). 2007; Hara, Bonk, & Angeli, 2000; Marcelo & Perera, 2007). nisms of cooperation will be explained with examples. Percentage summary of the discourse categories. gory with the highest percentage of frequency is greetings (40.9). although they are not defined in exactly the same way. the same dimension, called leisure. group to continue working jointly. course used, which include explicative and argumentative texts. clearer and more convincing to the rest of the group. Percentage of psychosocial relation cat egories. 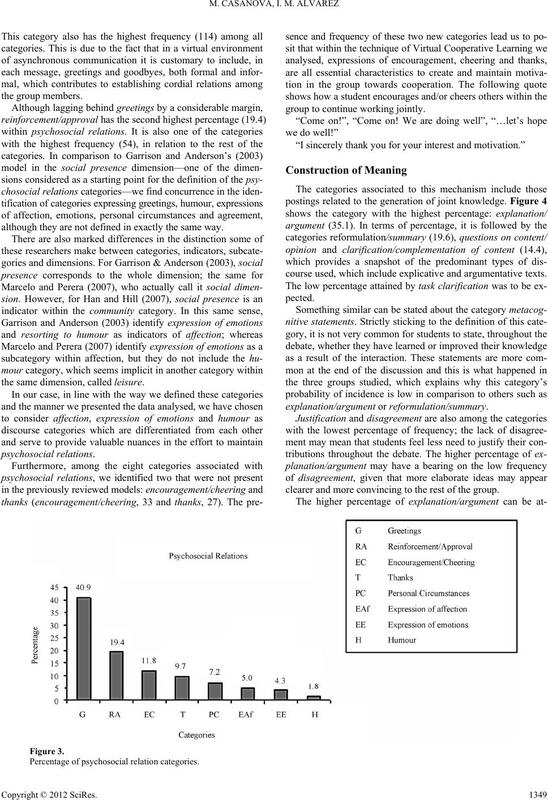 Percentage of constr uction of meaning categories. success was linked to the res t of the team’s and vice versa. clear the need for contributions from other members. chanism and the main goal in a cooperative learning process. relation to their essential mech a nisms. Percentage of positive interdependence categories. lowest in the cognitive dimension (Marcelo & Perera, 2007). characteristic of virtual cooperative learning. tive learning and promote its self-regulation. them and the way that the construction of meaning develops. during and at the end of the process. peer cooperation can be carried out by small groups of students. practical guide. 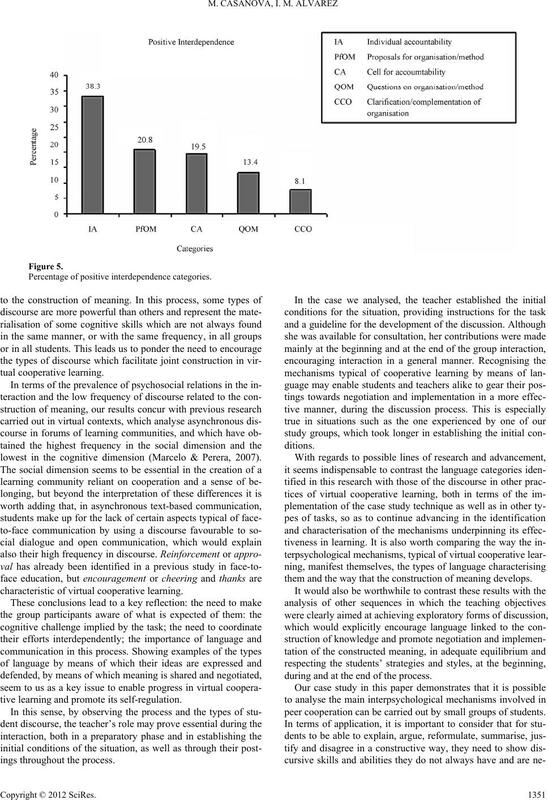 Journal of the Learning Sciences, 6, 271- 315.
nal of Educational Technology, 34, 265-279.
discussion groups; A review. Computers, and Education, 46, 6-28. (Ed. ), Three worlds of CSCL. Can we support CSCL (pp. 61-91). gies in Education (pp. 3 -18). Rhodes: Ka st a n io t i s.
ment of understanding in the classroom. L o ndon: Methuen. Garrison, D., & Anderson, T. (2003). E-learning in the 21st century. 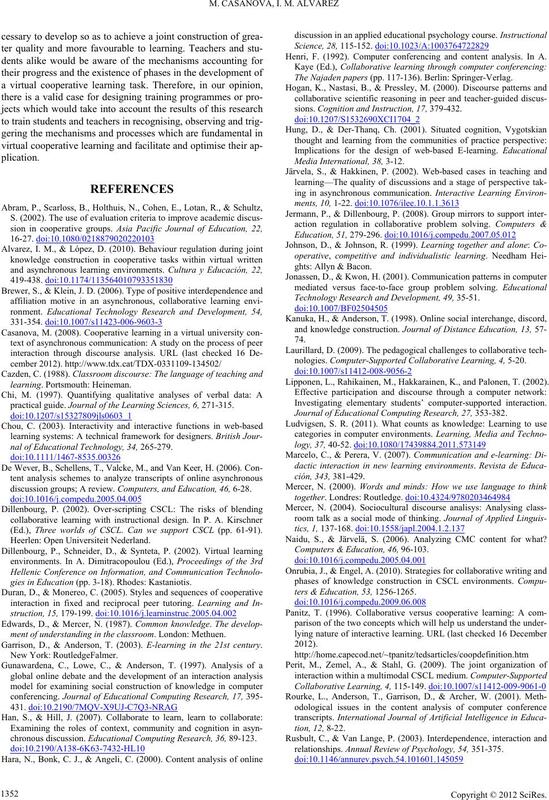 chronous discussio n. Educational Computing Research, 36, 89-123. Henri, F. (1992). Computer conferencing and content analysis. In A. The Najaden papers ( p p . 117-136). Berlin : S p ringer-Verlag. sions. Cognition and Instruction, 17, 379-432. Technology Research and Development, 49, 35-51.
nologies. Computer-Supported Collaborative Learning, 4, 5-20. 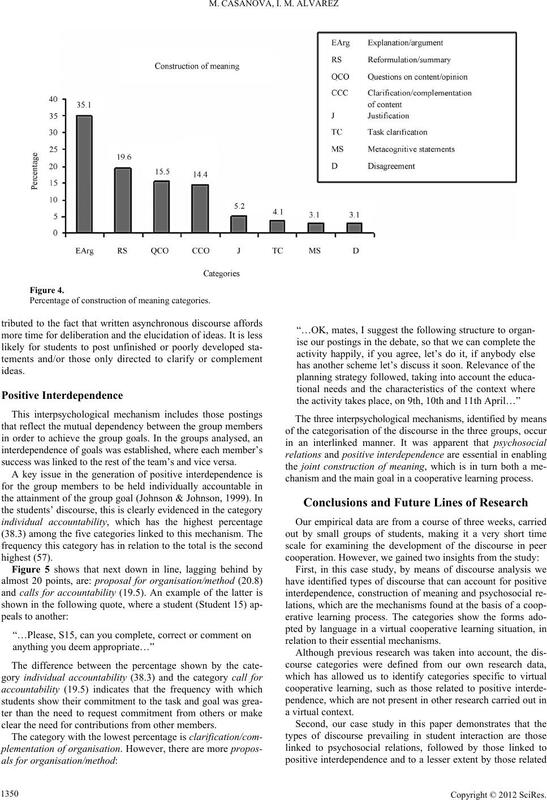 Lipponen, L., Rahikainen, M., Hakkarainen, K., and Palonen, T. (2002). Investigating elementary students’ computer-supported interaction. 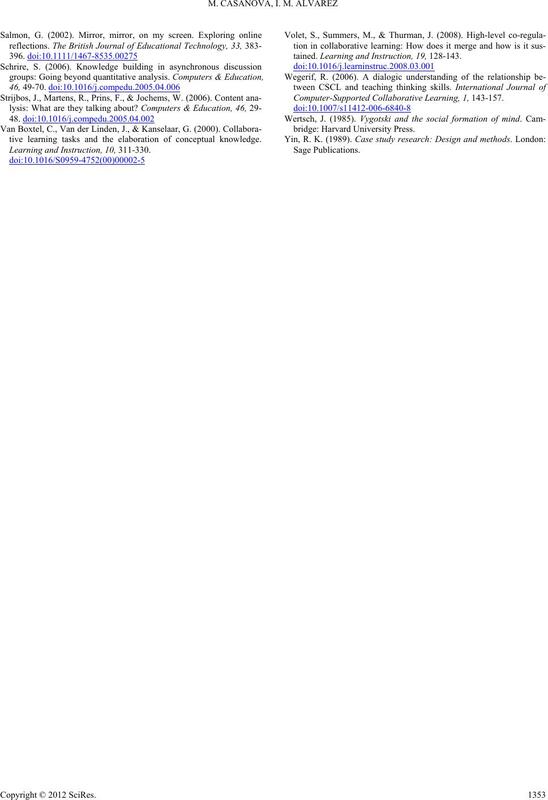 Journal of Educational Computing Research, 27, 353-382. Naidu, S., & Järvelä, S. (2006). Analyzing CMC content for what? Computers & Education, 46, 96-103.
ters & Education, 53, 1256-1265.
relationships. 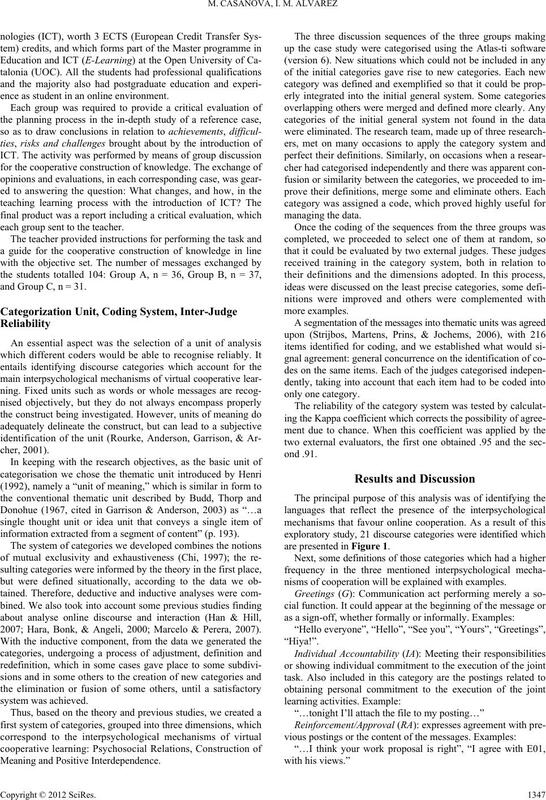 Annual Review of Psychology, 54, 351-375.
tive learning tasks and the elaboration of conceptual knowledge. Learning and Instruction, 10, 311-330.
tained. Learning and Instruction, 19, 128-14 3. Computer-Supported Collaborative Learning, 1, 143-157.